Thanks for everyone for visiting with us during ORIOLES Fanfest last weekend! What a turnout, about 12 to 15K according to the Orioles Staff! Now only if they can play as good as everyone hopes. Only a few weeks till pitchers and catchers report, then opening day right around the corner. Baseball Appraisals on January 16th! 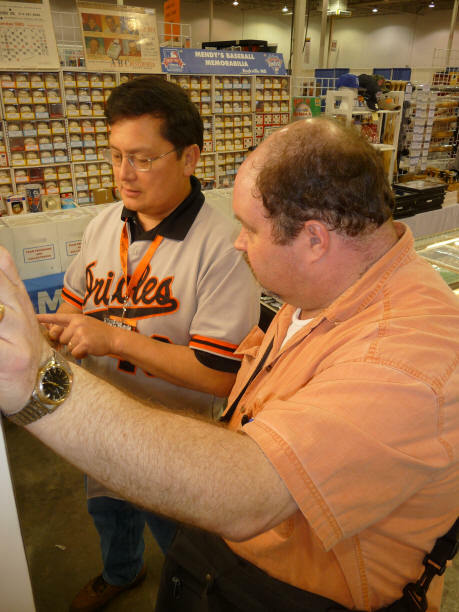 Sorry for the last minute information, but Mendys will be at the Westminster Antique Mall doing Baseball Memorabilia Appraisal, next Saturday, January 16th from 1 to 4 pm. Sorry for the late news. See you there! Here is a recent photo of me in action at the last CSA show in Virginia. Just a couple of weeks away! Baltimore Orioles Fanfest will be on January 23 at the Baltimore Convention Center. We will be there with all of our Orioles Items as well as baseballs and bats to get signed at the show! See everyone there!